Need more links but don’t know where to start? SEMrush has a Link Building tool designed for the sole purpose of running outreach to acquire links. Follow this workflow to get your campaign going. Go to the Link Building Tool, start a new Project or create a new campaign for an existing Project. Enter up to 10 keywords that you want to improve your organic rankings for. To further specify the scope of your link building prospects, take advantage of Google’s advanced search operators. You also need to add up to 10 competitors, whose backlink profiles you consider worthy replicating. If you are not what keywords to pick or what competitors to choose, the system will offer you a list based on the information form SEMrush database and the Organic Competitors report. When done, just press “Start Link Building” button. After SEMrush finishes collecting the information you’ll be taken to the Overview dashboard where you’ll be able to monitor the progress of your whole campaign: overall prospects, received replies, monitored domains, etc. The remaining 3 tabs of the Link Building tool: Prospects, In Progress, and Monitor will help you stay in control of your link building campaign at each stage. Start with reviewing prospects in the Prospects tab. Choose the ones that are relevant to your website and moving them to the In Progress tab using the “+” sign opposite the prospect’s link. In Progress tab lets you reach out to the selected prospects* and monitor the status of each your would-be backlink. *Please note, that to reach out to a prospect you’ll have to add a mailbox using the “Add” button at the top of the page. The email addresses of your prospects are added by SEMrush automatically. 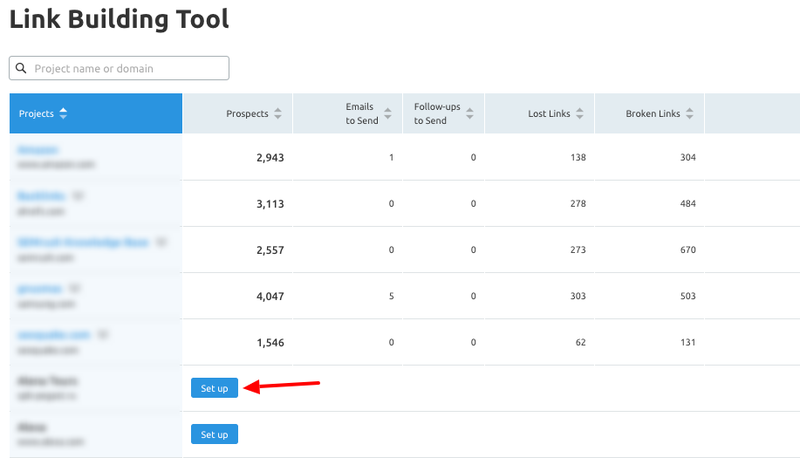 In case the email address field is empty, try these steps or this method to find an email address before moving on to the next prospect. In the Monitor tab, you can follow the progress of your link building efforts over time. All your prospective backlinks are marked as Active, Lost, Broken, Undefined or Rejected after you add the domains you want to monitor to this tab of the tool. If you are interested in learning more about link building with SEMrush, please refer to the corresponding chapters of our SEMrush Toolkit for SEO guide.